Characterful modern fuzz with a ton of options to dial in your exact needs. Mid hump is useful for cutting through a band mix. The contemporary sounds won't necessarily appeal to more vintage-minded players. 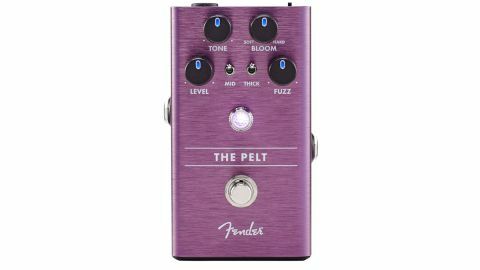 The Pelt supplements the standard fuzzbox controls of Fuzz, Output Level and Tone with a ‘Bloom’ knob and a pair of toggle switches to shape its silicon-based fuzz. Besides the standard sound, the Mid switch offers either a slightly scooped midrange cut or adds a mid hump for a bit more honk, while Thick fattens up the bottom-end. Combine those with the Tone knob that rolls back from an edgy top-end to a more woolly vibe, and you’ve got quite a tonal range to play with. The range of dirt is quite wide, too, from drive/distortion at lower levels of the Fuzz knob through to unmistakable full-on sustaining fuzz. The unique asset here, though, is that Bloom knob, which affects its textural character. As you turn it from ‘Soft’ to ‘Hard’ you get an increase in note attack, a spongier feel under your fingertips, plus more sustain and harmonics, moving towards a more sputtery fuzz experience.